WATCH: A Day Of British Diplomatic Honesty Caught On Camera : The Two-Way British Prime Minister David Cameron called Nigeria and Afghanistan "fantastically corrupt." Then, Queen Elizabeth II was taped calling Chinese officials "very rude" during a state visit last year. 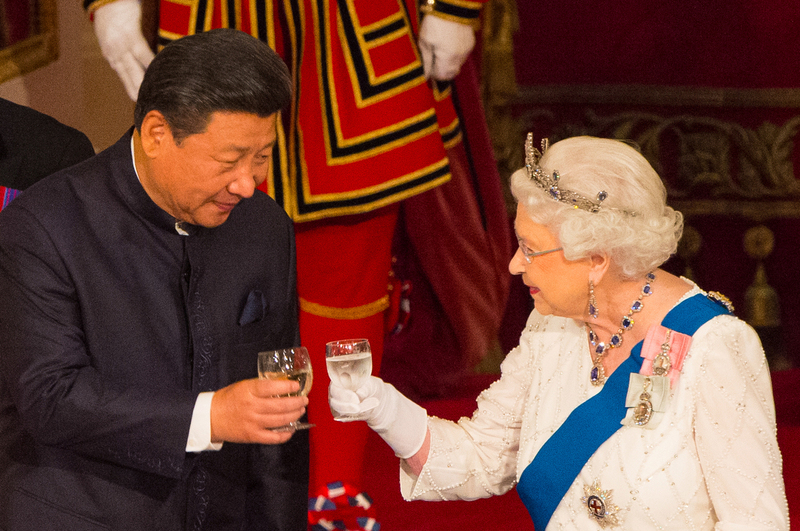 Chinese President Xi Jinping (left) toasts with Britain's Queen Elizabeth II during a state banquet at Buckingham Palace in London on the first day of the state visit in October 2015. Elizabeth said on camera that Chinese officials had been "very rude" during the official visit. It's been a difficult 24 hours for British diplomacy. First, British Prime Minister David Cameron was caught on camera Tuesday saying, "We've got some leaders of some fantastically corrupt countries coming to Britain," ahead of this week's anti-corruption summit. He then adds: "Nigeria and Afghanistan are possibly the two most corrupt countries in the world." This was during a conversation at London's Buckingham Palace with a group of people that included Queen Elizabeth II and the archbishop of Canterbury. Then, in a separate exchange at the palace that day, the queen is taped describing Chinese officials as "very rude." That happened at a garden party, as Elizabeth was introduced to Metropolitan Police Cmdr. Lucy D'Orsi, who led security procedures during the state visit of Chinese President Xi Jinping last October. Upon hearing of D'Orsi's role during the Chinese visit, the queen immediately responds, "Oh, bad luck." The Lord Chamberlain goes on to say that D'Orsi was "seriously, seriously undermined by the Chinese." D'Orsi is heard saying that it was "quite a testing time" and adds that at one point, Chinese officials walked out and said "the trip was off." The queen then says, "They were very rude to the ambassador." It's not clear what exactly the Chinese officials did that the queen deemed rude. The 2015 visit was aimed at boosting trade ties between China and the U.K., and at the time, the queen said it was taking their relations to "ambitious new heights," according to the BBC. NPR's Lauren Frayer tells our Newscast unit that "Buckingham Palace says it won't comment on the queen's private conversations." She adds: "There's been no official reaction from the Chinese, but a report about this was censored on BBC television inside China." The Associated Press reports that Lu Kang, a spokesman for China's Foreign Ministry, would not comment directly on the video, but emphasized that Xi's trip to Britain was "very successful." It's highly unusual for the queen to comment on political or diplomatic affairs. Furthermore, as The Associated Press reports, "media accompanying her are asked not to eavesdrop on private conversations." "The Queen's comments were picked up by the microphone of the camera filming the garden party event, operated by Peter Wilkinson, the monarch's official cameraman. "His footage was released to broadcasters under the 'pool' arrangement which is standard procedure for royal events (to avoid all broadcasters sending their own crews to every engagement). "It was only then that the uncharacteristically undiplomatic comments were spotted." Nigeria wasn't pleased with Cameron's comments on corruption. Nigerian President Muhammadu Buhari is calling on the U.K. to "return assets held there by corrupt Nigerians," in remarks ahead of a summit on Wednesday in London, Reuters reports. Buhari has pledged to fight corruption in Nigeria. "I am not going to demand any apology from anybody. What I am demanding is the return of assets," Buhari says, according to the wire service. "What would I do with an apology? I need something tangible." That sentiment was echoed by anti-corruption coalition Transparency International. "We should not forget that by providing a safe haven for corrupt assets, the UK and its Overseas Territories and Crown Dependencies are a big part of the world's corruption problem," the group says in a statement Tuesday. The group's 2015 corruption perception index puts Nigeria at 136 out of 167, with a higher number showing more perceived corruption. It ranks Afghanistan at 166 — only North Korea and Somalia have more perceived corruption.